Mike’s Custom Flooring is fully licensed and insured to offer commercial businesses and residential homes in the Eastern Panhandle of Berkeley and Jefferson Counties in West Virginia along with Frederick, Loudon, and Fairfax Counties of Virginia with a number of hardwood flooring project services. With our commitment to upholding high moral standards and work ethics, applying friendly customer service, and delivering superior execution on all services rendered on a consistent basis, we are dedicated to becoming your trusted hardwood flooring expert. 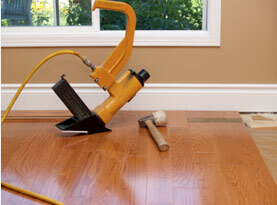 Mike’s Custom Flooring specialists utilize premium tools, supplies, materials, products and equipment exclusively offered to licensed professionals to ensure maximum results. Our technicians possess advanced training, years of experience, and extra ordinary skills that make them more than qualified to perform any task associated with our services. Can I Stain My Wood Floors Grey to Keep with the Latest Trend? Mike’s Custom Flooring encourages local commercial and residential properties to take advantage of our gray staining for hardwood floor service. With the latest trend of staining hardwood floors gray the homeowners and business owners alike are enjoying this adoring look. In pre-finished maple or birch hardwood floors, it is fairly simple to achieve a background gray color. These woods are close pored and absorb the stains differently on your commercial and residential hardwood flooring. Similar to red oak, in regards to pine floors, gray does not come out very well as pine has underlying yellow and red tones. With some darker brown stains, the stain is grayer, where the same stains will appear brown on oak, but gray on maple. Now with the accidental gray captivating the modern trendsetters, more and more people desire to have the gray stain on their hardwood floor, which is more commonly oak. Mike’s Custom Flooring performs gray staining services for the hardwood flooring in commercial businesses and residential homes to deliver a beautiful look. 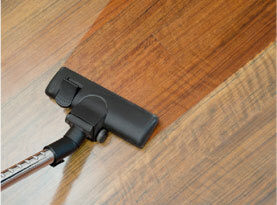 We are thorough and precise to ensure your hardwood floor is refinished with a beautiful shade of gray stain. 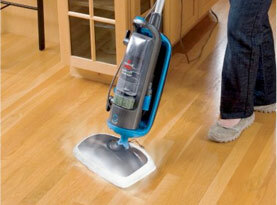 – We start by sanding down the top layer of floor, stains, or minor damage is especially attended to. 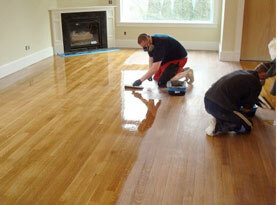 – In most instances, a lacquer is applied after the stain is fully dried. Hardwood floor can be tricky to stain, especially depending on the species of hardwood floor, on the manufacturing involved. To achieve the gray hardwood floor stain, it is highly recommended that you allow a professional to do it to preserve your hardwood floor from damage. Mike’s Custom Flooring is eager to perform gray staining for the hardwood floors in commercial businesses and residential homes. If you are wanting to be a part of the modern trend an enjoy the style, call Mike’s Custom Flooring today to get started!